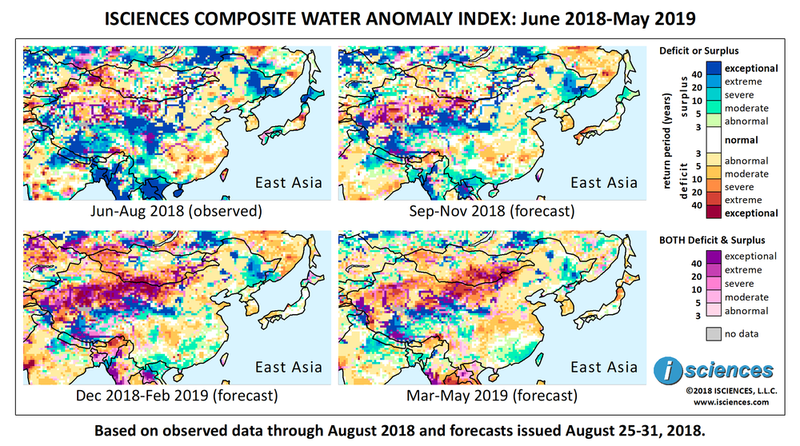 The 12-month forecast for East Asia through May 2019 indicates widespread surpluses in Heilongjiang and Jilin in Northeast China; along the Yellow River; in Qinghai, Sichuan, and Tibet; along the Yarlung River (Brahmaputra); and in Yunnan. Surpluses are also forecast for Hokkaido, Japan. Intense deficits are forecast for western Mongolia, and western Inner Mongolia and Xinjiang in China, along with conditions of both deficit and surplus as transitions occur. Primarily moderate deficits are expected in Guizhou and Hunan, China, and in South Korea. Deficits of greater intensity are forecast in southwest Honshu into Kyushu, Japan and in Yamagata and Miyagi Prefectures in northern Honshu. The near-term forecast through November indicates that widespread surpluses in Northeast China’s Jilin and Heilongjiang Provinces will persist and will be extreme to exceptional, leading west along the Nemor (Namoer) River into northeastern Inner Mongolia. Surpluses are forecast along the Yellow River and in Shaanxi, southern Gansu, Qinghai, western Tibet, the Yarlung River (Brahmaputra), and far western Xinjiang. Surpluses will reach exceptional intensity in many of these regions. Moderate to severe surpluses are forecast for southern portions of Yunnan, Guangxi, Guangdong; parts of Fujian, Hunan, and Sichuan; and Hebei and Henan farther north. Deficits of varying severity, including some areas of exceptional intensity, are forecast from western Inner Mongolia stretching across much of Xinjiang along with conditions of both deficit and surplus as transition occur. Moderate to severe deficits are expected in the Lower and Middle Yangtze River Basin. Elsewhere, moderate deficits are forecast for South Korea; severe deficits for southwest Honshu, Japan into western Kyushu; and surpluses for Hokkaido. In Mongolia, surpluses are forecast in the east and north, and deficits in the south and west. From December through February, widespread exceptional deficits are expected to emerge in northwestern China from Xinjiang through western Inner Mongolia, and in Mongolia. Moderate to exceptional surpluses will persist in Jilin and Heilongjiang, China and along the Nemor (Namoer) River west into northeastern Inner Mongolia. Moderate to severe surpluses are forecast along the Lower and Middle Yellow River leading to widespread intense surpluses persisting in Shaanxi, southern Gansu, and Qinghai. Surpluses will also persist in western Tibet and along the Yarlung (Brahmaputra) River but both deficits and surpluses are also forecast as transitions occur. Surpluses will persist in southern China and will increase in the southeast, transitioning from deficits around Hunan. Moderate deficits will persist in South Korea but retreat to the southern half of the country, and moderate deficits will emerge in Shandong, China. Deficits in southwestern Honshu, Japan will moderate. The forecast for the final three months – March through May – indicates persistent, intense deficits from Xinjiang into Inner Mongolia and Mongolia, persistent intense surpluses in Qinghai and Tibet, increasing moderate deficits in the Yangtze Basin, and increasing moderate surpluses in southeastern China. Typhoon Rumbia affected nearly 9.5 million people in China, killing at least 22, and dumping 3.9 times the amount of rain forecast in one Shandong city in the northeast. Flooding from the storm ravaged China’s largest vegetable-producing area and home to its largest wholesale market. Vegetable prices in Shouguang City, Shandong spiked 30 to 40 percent following the storm, leaving people worried that prices in the rest of the country will follow suit. City residents are blaming officials for exacerbating flooding by releasing water from three reservoirs during the storm. As of September 1, heavy rain and flooding in southeastern China has inflicted direct economic losses of over 1 billion yuan (USD$147 million) in the Pearl River delta and eastern Guangdong, and affected more than 1.23 million people. Rains extended to central and southern Taiwan, causing agricultural losses estimated at NT$370 million (USD$12 million). The flooding killed six people and cut power to tens of thousands of households. Severe flooding from heavy rains killed at least 76 people in western North Korea late last month. Flooding and landslides destroyed over 800 buildings. The flooding comes roughly a month after a severe heat wave killed dozens and strained agricultural production on the Korean peninsula. And while international sanctions imposed on North Korea exempt humanitarian activities, the curtailing of banking and shipping transactions with the country has impeded the availability of supplies for humanitarian operations. Typhoon Cimaron hit western Japan last month, grounding over 350 flights, resulting in power outages in over 135,000 households, and likely causing the deaths of three university students who disappeared from a storm-swept beach.